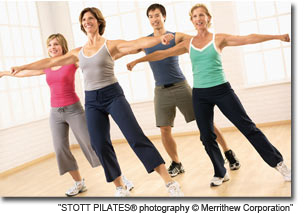 This initial private session begins with a review of your goals for a Pilates program and your health/physical history. The instructor will assess your posture and alignment, both standing and dynamic (during movement) to inform you of muscular imbalances, as well as strength and flexibility throughout your body. Based on the assessment, the instructor will introduce fundamental Pilates exercises customized to your goals and fitness level. This personalized evaluation is intended to educate and provide the client with foundation from which to continue a Pilates program. Whether you are interested in a group, private or semi-private session at The Pilates Body, the introductory private is invaluable. In private sessions you will work with a STOTT PILATES instructor on a one-to-one basis, following a customized program tailored to your specific goals and fitness level. Private sessions are beneficial for a full spectrum of needs, be it for sports-specific training, pre- or post-natal exercise, post-injury rehabilitation, and overall conditioning. Semi-private sessions give you the benefit of a customized workout with the advantage of workout partner - to help motivate you when you need the boost! Our semi-private clients frequently come with a friend, mother, daughter, or as a couple, for optimal results.